A kakuuchi is booming as a spot where you can enjoy sampling sake casually. 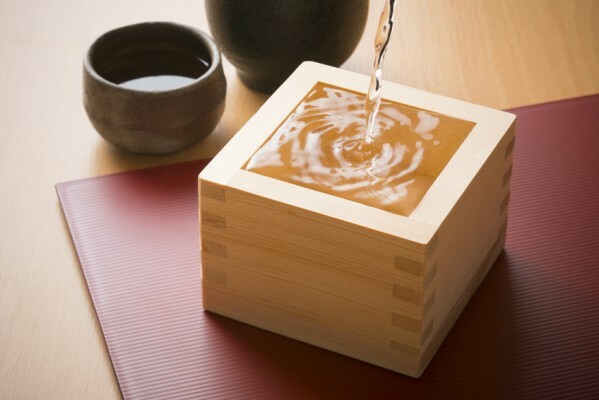 The word kakuuchi may come from the fact that people used to go to a liquor shop to buy sake and while it was measured using a masu cup (a wooden square box) they started to take the masu cup, grabbed salt kept in the store, put the salt on the rim of the cup and enjoyed sake. A kakuuchi means a simple area set up in a liquor store where people can enjoy sake and also means drinking sake there. As both a liquor license and restaurant license cannot be issued for the same place, some liquor stores used to set up a table and counter at the corner of the store to serve sake with snacks and canned food to make it look like, “customers bought sake and they are drinking and eating without asking”. Eventually, this took the form of standing bars. On the contrary, when people say they want to bring out sake served in the restaurant, the cap of the sake bottle should always be opened in order to prove that the sake is not for sale. However, as you can see in recent eat-in areas of department stores, if the area is clearly divided into a liquor section and a restaurant section, there are some cases where both licenses can be issued. There are increasingly many kakuuchis run by young owners who get both licenses respectively and serve savory snacks and drinks. You will find your favorite kakuuchi, ranging from old-fashioned ones r young owners who get both licenses respectively and serve savory snacks and drinks. You will find your favorite kakuuchi, ranging from old-fashioned ones run by established liquor stores to stylish ones. This is just a kakuuchi, but I feel comfortable and now find myself….